We’d love your help. 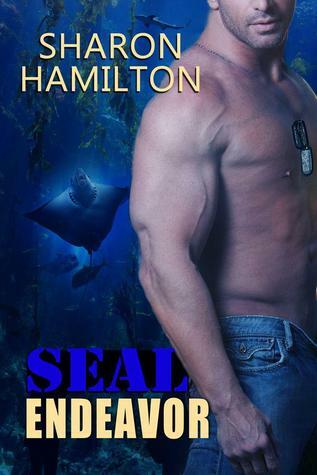 Let us know what’s wrong with this preview of SEAL Endeavor by Sharon Hamilton. To ask other readers questions about SEAL Endeavor, please sign up. A short, but good intro for the main characters in the next full length novel "Fallen SEAL Legacy" in the SEAL Brotherhood series. Coop and Libby have numerous almost-meets, but fate steps in and they don't get a chance to even talk. They both make a huge impression on each other so hopefully they get their chance in the full novel. Can't wait to start reading it. I would recommend the series to anybody. Cooper, a SEAL three medic, and Freedo, a fellow SEAL member, travel to buy a prototype drone from a private seller and keep getting glimpses of Libby and her friend Megan. This is a short teaser intro to a series that ends with a cliffhanger grab for the next full length installment. My brief opening sentence of this review pretty much sums up this book. Great intro to the characters. I'm looking forward to Fallen SEAL Legacy. While Coop and Fredo are looking for a drone for Coop, he see's a woman that catches his eye. Libby happens to see Coop as well while she's out with her advisor and her friend another time. With their chance glances will they ever get the chance to chat with one another? Well written but nothing at all to this book. Just a set up that really isn’t needed. Having not yet read any books in the SEAL Brotherhood series, part of me wondered how this short story prequel would stand on its own. A contemporary piece, set in "our" world, this is not a story that requires a lot of world building... yet it seems to capture both University life for Libby and her surrounding characters, as well as military/ SEAL life for Coop and Fredo. A quick, relaxing read, that includes a trip to the beach... reading this, in a way, felt like a cross between spending a day with the characters, and going on vacation with them. This is a short story. It really caught my interest. I enjoyed the strong male characters and their interaction. Everything weaves well into good story. But the ending was unsatisfactory. I was expecting an ending. Not a HEA, but something type of resolution. Thankfully, the ending is not a cliff hanger. I am going to get the next book. I am really looking for more great stories from this author. This book tells how Cooper and Libby almost met. I was gifted the boxed set so my review will be the same for both. This book focuses on Cooper. Hes 6'4 and is the medic of Team 3. He is also super cheap! This book doesn't leave anything out. There is action, romance, lust, love and sadly tragedy. I loved everything about this book. I couldn't put this book down....its that serious. GREAT READ!! Love the series! This book was included in the Brotherhood Series-Set Two with Fallen SEAL Legacy. Once again Hamilton has made sure to include a real quick novella to highlight how the relationship began with Libby and Coop (Cooper). Real quick to read but not a must to read to understand the Fallen SEAL Legacy novel. I got this book as a free download and, like all of Sharon Hamilton's books, I liked it. I was disappointed that it was so short because I wanted more, but I guess that was the object of the book to introduce us to the main characters. I can't wait to find out what will actually happen to the pair once they meet and I am confident that I will love that book. This tiny short does great things to set up for its sequel in that it has literally left me hanging off my seat waiting for more which I'll no doubt be reading to find out if Mr. Calvin Cooper does get the woman. I expect loads of action, heat and some chasing since Ms. Hamilton surely has not disappointment me with Books 1, 2 and 3 of her SEAL Brotherhood series. This teaser for Cooper and Libby would have been better served to have been part of their full length story in the book that tells their romance tale. For me it was not pointless writing or reading but not something gripping or enticing enough either. Great short story.. I love how many times they just missed each other. Serendipity is a fickle thing. Going to read the next book to see what happens when these too actually come face to face!!! Funny how life is ! This is not meant to be a stand alone short story! This short introduces us to characters from the next full length novel, Fallen SEAL Legacy. The background information was helpful when reading the full length novel. This book was very short and not much of a read - just 2 people who kept getting glances of each other. No romance, no action, nothing. Glad I got it for free or I would have been very mad. Looking forward to more in this series! I love the excitement in the situation that come up and trying to figure out who is involved and connected to the trouble. Good into teaser for the second book. I don't understand why this story is necessary. It could easily have been included as a prologue. On its own it is a waste of time. prequel that explains an almost meet between coop and libby. I think it would have been better though just attached as the main novel instead of having it be totally separate. Another prequel to a novel where the main characters "meet" but not really meet. Again, he see he and wants her and she hardly notices him. Not sure what the point of the novellas are. This could've been added to beginning of book 2. I love these little novellas of chance encounters! I think they are a nice little touch to the actual story. I like an author who lets each character have their own story along with bringing in the characters that are important to each others stories. great book. This novella is not really necessary to read before the actual book that comes after it. If you are smart enough, you can figure it all out - For $0.94, I read it anyway.